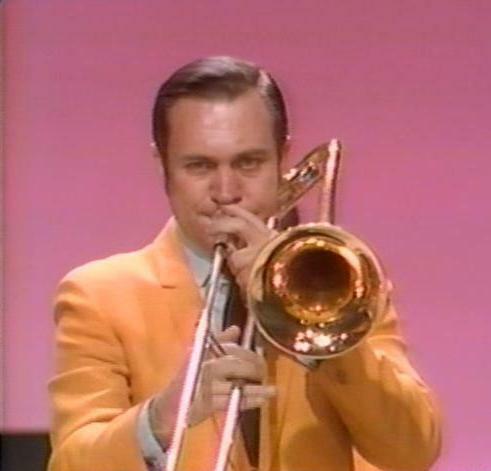 Bob Havens played the trombone for the Lawrence Welk Show from 1960 to 1982 and fashioned a reputation as a notable Dixieland jazz trombonist and leading example of the Jack Teagarden style. His powerful delivery and smooth phrasing have made him much in demand at jazz festivals and concerts throughout the world. Havens was born to a musical family in 1930 in Quincy, Illinois and began studying violin and trombone at age 7, playing both instruments throughout his school years. He landed his first professional job with a local dance band at age 12 and at the age of 16, received a trombone scholarship from the Interlochen Music Camp in Michigan. Havens went on to hold the first trombone chair in the school's 250 piece concert band. Afterward, he also held the first trombone chair in the Quincy Symphony. After serving in the Illinois National Guard as a bandsman during the Korean conflict, He left Quincy in 1955 to tour with the Ralph Flanagan Orchestra. In 1956, he joined George Girard's Dixieland Band at the Famous Door in New Orleans. There, he met his idol, Jack Teagarden. In 1957, Bob joined fellow Welk Show alumni Al Hirt at Dan's Pier 600 on Bourbon Street in New Orleans when Hirt formed his very first band. The front line consisted of Hirt, Havens and Pete Fountain. During this time, he recorded albums for Good Times Jazz and Vic labels with the Girrad band and on Verve and Audio Fidelity with Al Hirt. He also recorded about a dozen albums for the Southland label with many other New Orleans musicians. Bob stayed with the group until 1960 when he was persuaded to move to the West Coast and join the Lawrence Welk Orchestra as a featured soloist on their weekly TV series. Since leaving the show in 1982, he has continued to be active as a free-lance professional working often with the Bob Crosby Bob Cats and the Benny Goodman Orchestra (led by clarinetist Peanuts Hucko). From 1985 to 1995, Havens played with the Great Pacific Jazz Band along with Bob Ringwald (lead vocals/piano), Don Nelson (saxophone), Jim Turner (piano) and Zeke Zarchy (trumpet). Bob also performed at the Welk Champagne Theatre in Branson, Missouri. Bob lives in Quincy, Illinois.